THE TALK leading into the Western Bulldogs' round four clash with Sydney centred on the realistic possibility of a fifth-gamer taking on Swans superstar Lance 'Buddy' Franklin. That player was 18-year-old Aaron Naughton, whose role ultimately was more in support of captain Easton Wood despite him conceding 12cm and 21kg to Franklin. But part of Naughton's job description involved going back with the flight of the ball in front of a rampaging Franklin. It was no small ask for a teenager, something Franklin himself acknowledged after one such contest. "I was running back and Buddy said, 'Well done, you'll have a future in the game', so that was one moment that's stuck out for the year," Naughton told AFL.com.au after learning he was the round 23 NAB AFL Rising Star nominee. "For someone like him to say that meant a lot and I was a little shocked – it's something I'll remember." It's not just Franklin's head that Naughton turned in a highly impressive debut campaign, where the 195cm defender ran out for his first game in round one and played 18 matches either side of an ankle injury. He capped his season with 18 disposals (12 contested), nine marks (six intercepts and five contested), five score involvements and four rebound 50s as the Bulldogs fell narrowly short of Richmond. Naughton's coach Luke Beveridge sent him to some of the game's best forwards this year, including extended time on Jack Riewoldt, Ben Brown, Jeremy Cameron and Charlie Curnow. He thrives on the learning experience and is still in the honeymoon phase of his AFL career where these types of experiences are "fun". "Bevo's been good right from the start to me, playing me in two JLT (Community Series) games, then backing me in from round one," Naughton said of Beveridge. "So this is just a bit of repayment for him backing me in. "Even though I'm a first-year player, he reckons I'm up to it, so I'll continue playing footy and approaching each challenge as it comes." Naughton was born in Victoria and grew up near Frankston, but relocated with his family to Western Australia as a nine-year-old, so joining the Bulldogs in last year's draft meant a big change again. With that move came great expectation, too, with the sticky-handed prospect snapped up as a top-10 draft pick. "Coming straight out of high school and then being drafted at the end of last year, I pretty much packed my bags two days after my name was called out by the Bulldogs," he said. "Now I'm living here in Melbourne away from family and friends, which is definitely a big challenge, but as with most people getting drafted, I'm happy to do it. "This is what I've always wanted to do and it was definitely a big move, but I've loved every minute of it so far." 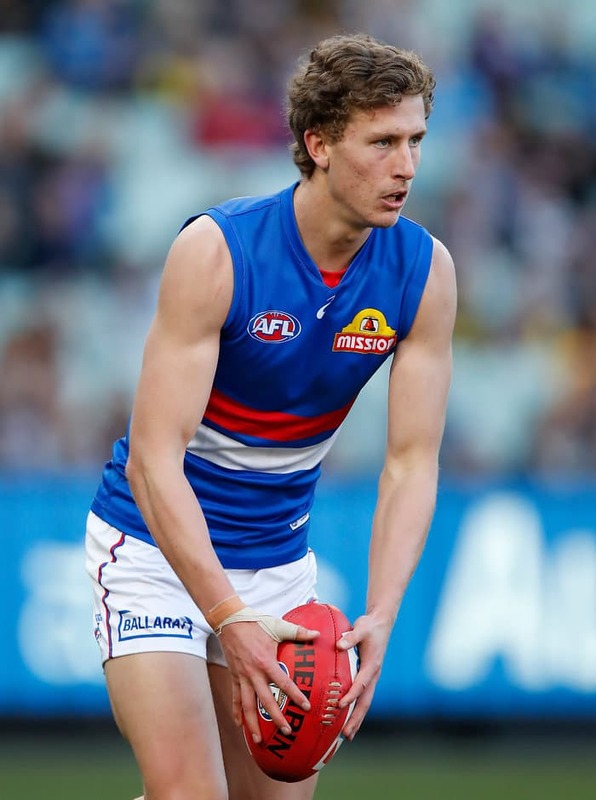 They are words of substance, given Naughton – who also showed promise as a forward in 2018 – added a further season in June to his automatic two-year draft deal and is now committed to the Kennel until 2020. He will head back to WA in his off-season break, but intends to start next season stronger physically and after a summer spent focused on improving his kicking. "The first couple of years as a young player, you just try and learn the ropes and do the best you can," Naughton said. "The first year's been a tick and I've been able to do that, so I'll build from there. "It's a young crew at the Dogs and I believe we'll rise back up again soon." As you say, it was a class act. About bloody time. He has been a great pick up.